The Lords' Veto Bill—Mr. Lloyd George's Budget—Mr. Balfour retires— He is succeeded by Mr. Bonar Law—The Home Rule for Ireland Bill introduced by Mr. Asquith—The Anti-Home Rule Campaign in Ulster led by Sir Edward Carson—The Signing of the Covenant on Ulster Day—Mr. Balfour moves the Rejection of the Bill—His Reference to "the Real Assassins"—Sir Edward Carson and Mr. F. E. Smith suggest the Exclusion of Ulster from the Bill—Mr. Winston Churchill's Pronouncement—Great Demonstration in Belfast of Ulster Business Men—The Bill "expires" for a Second Time—Army Officers on the Curragh, when ordered to Belfast, resign—Gun-running Exploit by the Ulster Volunteers. King Edward died at a time when the country was sharply divided on a grave constitutional controversy—the limitation of the power of the Peers. The history of this question is interesting. Among the larger measures undertaken by the Asquith ministry were the introduction of Old Age Pensions, the settlement of the education controversy, and the Reform of the Licensing Laws. The first of these was, as we have seen, carried into force, the second was abandoned after repeated efforts to satisfy the claims of conflicting religious denominations, the third was vetoed by the Upper House. The action of the House of Lords in this matter lent renewed vigour to the demand of the Liberal party for some curtailment of the power of the Peers. The General Election, which began on the 14th January, 1910, resulted in the return of a Liberal majority of 124, the main issues of the contest being the Lords' Veto Bill, Mr. Lloyd George's Budget, and the policy of Tariff Reform. In order to facilitate matters, a conference was held of the leaders of the various parties at variance, at which Messrs. Asquith, Lloyd George, Birrell, A. J. Balfour, Austen Chamberlain, and Lords Crewe, Lansdowne, and Cawdor met. The first meeting was held on the 17th of June, 1910, and the last on the 10th of November, there being twenty-one meetings in all, but no agreement was arrived at. Dissolution of Parliament took place on the 28th of November. The General Election which followed resulted in a Ministerial majority of 126. The new Parliament met on the 6th of February, 1911, and on the 21st the Parliament Bill was introduced, having for its object the limitation of the duration of parliaments to five years. In November Mr. Balfour retired, and Mr. Bonar Law became leader of the Conservative party, with Lord Lansdowne leader in the Lords. "Being convinced in our consciences that Home Rule would be disastrous to the material well-being of Ulster, as well as the whole of Ireland, subversive of our civil and religious freedom, destructive of our citizenship, and perilous to the unity of the Empire, we, whose names are underwritten, men of Ulster, loyal subjects of his Gracious Majesty King George V, humbly relying on the God Whom our fathers in days of stress and trial confidently trusted, hereby pledge ourselves in Solemn Covenant throughout this our time of threatened calamity to stand by one another in defending, for ourselves and our children, our cherished position of equal citizenship in the United Kingdom, and in using all means which may be found necessary to defeat the present conspiracy to set up a Home Rule Parliament in Ireland; and, in the event of such a Parliament being forced upon us, we further solemnly and mutually pledge ourselves to refuse to recognize its authority. In sure confidence that God will defend the right, we hereto subscribe our names, and, further, we individually declare that we have not already signed this Covenant." Five days only separated the conclusion of the session of 1912 and the opening on the 10th of March of the new session of 1913. The Bill providing Home Rule for Ireland was under consideration when the year opened. 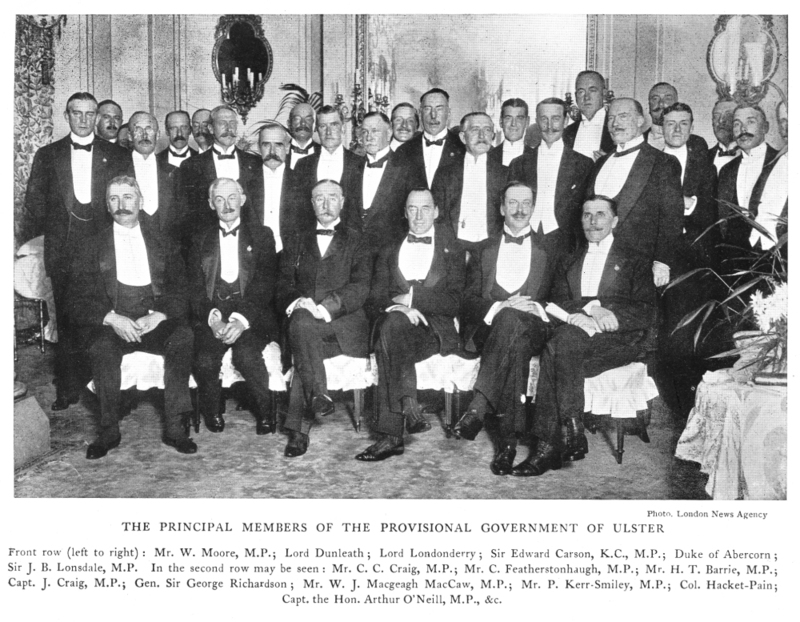 On the 1st of January Sir Edward Carson moved an amendment to exclude the four north-eastern counties of Ulster from the provisions of the Bill, but stated in doing so that, even if the amendment were carried, the Bill as a whole would still be opposed root and branch. Mr. Bonar Law declared that north-eastern Ulster would prefer to be governed by a foreign country than by a Nationalist Parliament in Dublin; but if the Bill were submitted to a General Election, and approved by the electors, he and his party would not be prepared to encourage Ulster to resist it by force. The amendment was rejected by 294 votes to 197. On the 16th of January the third reading of the Bill was carried by 367 to 257 votes, the result being received by the House with uproarious cheering. The rejection of the Bill was moved on this occasion by Mr. Balfour, who declared that "if blood is spilt, I can say confidently that the real assassins will be those who will never have the courage to face the situation". Mr. Asquith, in reply, said the Government would be glad to meet any claim of the north-eastern counties which were founded on justice, or even apprehension, if it could be met without doing injustice to Ireland as a whole. But, he added, a minority was not entitled to thwart and defeat the demands of the great majority of their countrymen. Mr. Bonar Law, winding up the debate, said the Unionists of Ulster would resist the present Bill, and he contended they would be supported by the overwhelming majority of the people of England and Scotland. On the 30th of January the Lords rejected the Bill on second reading by 326 to 69. In May, 1913, Sir Edward Carson reopened his campaign in Ulster and declared: "Our right to remain citizens of the Imperial Parliament is a right that is a vital one, and in the words of President Lincoln, it justifies and gives us a moral right to do anything that is necessary, even to the use of force". In October Sir Edward Carson and Mr. F. E. Smith both announced that a solution of the problem might be found by excluding Ulster from the Bill, or at any rate "that portion which is homogeneous in its views". A little later, in a speech made at Dundee, Mr. Winston Churchill declared that the Government, relying on the mandate of the two General Elections in 1910, intended to pass the Act "in the lifetime of the present Parliament", and added: "It is obvious that the claim of north-east Ulster for special consideration for itself is a very different claim from the claim to bar and defeat Home Rule and to block the path of the whole of the rest of Ireland; and it is a claim which, if put forward with sincerity, not as a mere wrecking measure, cannot be ignored or pushed aside without full consideration by any Government dependent on the present House of Commons. There was", he said, "only one thing to compensate the Irish Parliament for the grievous loss to its efficiency and strength which would result from even a temporary absence of the representatives of north-east Ulster—the binding in honour of both political parties to carry the settlement through and bring it in the course of years to final and complete success." This offer gave much satisfaction to Ulster Unionists, but the Unionists of the south and west of Ireland protested against their opposition to the Bill being disregarded. Mr. John Redmond, on the other hand, maintained that the proposal of exclusion was "quite impracticable and unworkable"; but while he repeated his order of "full steam ahead with Home Rule", he stated that he was willing to consider any further suggestions. Many speeches were made throughout the country on the subject. Mr. Asquith, at Ladybank, on the 25th of October, said that the Government were quite ready to entertain the suggestion of some special treatment of Ulster if not inconsistent with the general principle of the Bill, but they had been met with the assertion that no such provision would reconcile the hostility to the Bill as a whole. Mr. Bonar Law and Mr. Balfour demanded a general election, "which will at least prevent civil war". Mr. Austen Chamberlain said any settlement arrived at "must be one which respects the scruples and guards the liberties of Ulstermen as absolutely as our own". On November the 4th a remarkable demonstration of the business men of Ulster took place at Belfast to protest against the Home Rule Bill. It was stated that the capital represented aggregated about £145,000,000. Sir Edward Carson, in addressing the meeting, said: "The fact that the business community is prepared to take risks will be a guarantee that we will conduct the fight, if it is forced upon us, in a manner that is most responsible". Resolutions were passed approving of "the various measures taken for the defence of our liberties, including the organization of the Volunteer force", and expressing the solemn resolution of those present to withhold the payment of all taxes so long as any attempt to put into operation the provisions of the Home Rule Bill was persevered with. Later, Sir Edward Carson said: "Things have gone so far, and we have been driven to such a course, that we can never accept any arrangement which is inconsistent with the Covenant we were driven to enter into". Mr. Bonar Law, speaking at Norwich on the 13th of November, said: "If the Government attempt to coerce Ulster before they have received the sanction of the people, we shall support Ulster in her resistance". In the meantime, with the other measures to which the Parliament Act was applied, the Home Rule Bill was presented and read a first time in the House of Commons on the 7th of May. On the 9th of June, moving the second reading, the Prime Minister said the Bill represented the considered judgment of the House of Commons, and added that he would welcome any suggestions towards strengthening any of the safeguards which might be inadequate. Mr. Balfour moved the rejection, declaring his belief that the country was on the verge of a great national tragedy. Sir Edward Carson maintained that Ulster had behind her, in her armed resistance, the whole force of the Unionist party, while Mr. Redmond urged that the passing into law of the Bill would mean the opening of a new era of Irish content and Imperial unity. The motion for rejection was defeated by 368 to 270, and the Bill was read a second time. The third reading was agreed to on the 7th of July without a division, after the defeat by 352 against 243 of a motion brought forward by Mr. Bonar Law. On the 14th of July the House of Lords commenced a two days' discussion on the second reading, which was moved by Lord Crewe. In reply, Lord Lansdowne moved that the House declined to proceed with the consideration of the Bill until it had been submitted to the judgment of the country. Lord Lansdowne's motion was carried by 302 to 64, and the Bill "expired" for the second time within a few months. The King's speech of the 10th of February, 1914, expressed regret that "the efforts which have been made to arrive at a solution by agreement of the problems connected with the Government of Ireland have, so far, not succeeded". The situation became critical on the subject. Mr. Walter Long moved a resolution calling for a General Election before any further step was taken with a Home Rule measure. In the Upper House this was carried by a majority of 188, Earl Roberts declaring that it was unthinkable that the British Army should be called upon to fight against the Ulster Volunteers; which eventuality, he said, would shake the Army to its foundations. In the Commons Mr. Austen Chamberlain said that the exclusion of Ulster was the only possible basis of peace. Sir Edward Carson declared that if the Government sought to compel the people of Ulster to go to a Dublin Parliament he would go on with those people to the end in their policy of resistance. On the other side, Mr. John Redmond said he shared to the full the anxiety expressed in the King's Speech for a settlement. The resolution was defeated on the nth by a majority of 78. 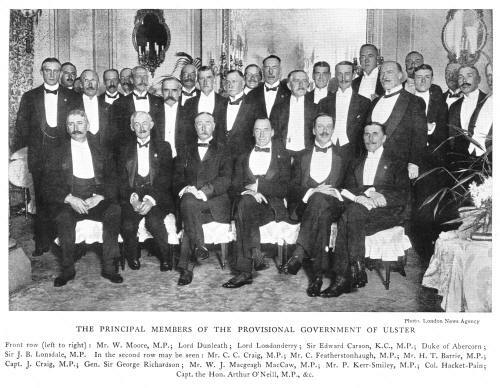 The Home Rule Bill was introduced for the third time into the House of Commons on the 9th of March, but on the 13th Mr. Asquith made an offer to secure a settlement by consent of an exclusion of Ulster for a period of six years, after a poll by counties of those counties of Ulster which so decided. The boroughs of Belfast and Londonderry were to be regarded as counties for this purpose. Mr. Bonar Law at once declared that if the proposal represented the Government's last word, he could not see how it was possible to accept it. Mr. Redmond said the Prime Minister had gone to the extremest limits of concession, but if the proposals were frankly accepted by the Unionists as a basis of agreement and peace the Nationalists were prepared to accept them in the same spirit. Mr. William O'Brien protested against Ireland being reduced to a thing of shreds and patches; and Sir Edward Carson, while admitting that something had been gained by the admission of the principle of exclusion, declared that "we do not want a sentence of death with a stay of execution for six years". If the Government took the time limit away he would go to Ulster and call a convention to consider the proposals; but if the time limit were not removed — Ulster was ready for any emergency! A vote of censure on the Government was rejected by a majority of 93. The situation became very serious. 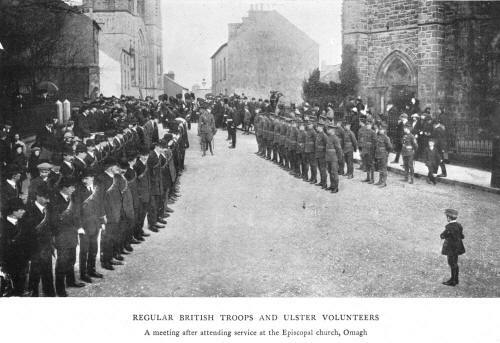 On the 20th of March it was announced that a grave crisis had arisen in connection with the troops in Ireland; that in consequence of orders to move troops into Ulster, and the sending of a warship to Belfast, a number of army officers at the Curragh had tendered their resignations. The Prime Minister explained that the instructions given to General Sir A. Paget, commanding in Ireland, were only that it might be his duty to go to the assistance of the civil authorities in Ulster. There had, however, been an "honest misunderstanding". On the 24th of March it became known that Colonel Seely (Minister of War), Sir John French (Inspector-General), and Sir J. S. Ewart (Quartermaster-General) had initialled a memorandum given to Brigadier-General H. P. Gough, commanding the cavalry on the Curragh, pointing out that it was the duty of all soldiers to obey lawful commands, and concluding: "But they (the Cabinet) have no intention whatever of taking advantage of this right to crush political opposition to the policy or principles of the Home Rule Bill". The publication of this last clause caused a political sensation. On the 25th Colonel Seely apologized in the House of Commons for having amplified the memorandum to General Gough, after the text had been approved of by the Cabinet, and tendered his resignation. A White Paper was issued, showing that on the 14th of March the War Office had warned General Sir Arthur Paget, commanding in Ireland, to ensure protection to stores in Ulster, and that General Paget reported on the 20th that General Gough and 57 officers of the 3rd Cavalry Brigade preferred dismissal from the Army to going north. These officers were suspended, but afterwards reinstated, the King having expressed approval of such a course. The Home Rule Bill came up for second reading on the 6th of April, and was carried by 356 to 276 votes. On the 12th of May Mr. Asquith said if a settlement on Ulster were come to it must take the form of an Amending Bill. Before this pronouncement, however, much excitement had been caused by a gun-running exploit of the Ulster Volunteers on the 24th of April. The Provisional Government in Ulster having purchased in Germany some "50,000 of the most modern magazine rifles and 3,000,000 rounds of ammunition", had them sent by lighter to await the arrival of the Fanny off the southern coast of Norway, to which the 300 tons of cargo were transferred. The papers of the Fanny were taken by suspicious officials of the Danish Government, but she sailed without them. She lay off the coast of Donegal for days, refusing to be interviewed by the coastguards, the time being employed to conceal her real name with a canvas screen, on which was painted the significant word "Mountjoy" (the name of the vessel that broke the boom and relieved Londonderry in 1689), and, while the attention of the authorities was directed to Belfast, she stole into Larne harbour, and her cargo was landed and distributed by motor-cars all over Ulster in a single night.